Has it really been two and a half months since my Sith inquisitor hit fifty? So it has. It feels rather embarrassing to admit that in all that time, I didn't bother to complete her class story until tonight. What can I say, I always get distracted by yet another alt... it wasn't until last week when Pet Tank and I decided to pull ourselves together and finally burn through Voss and Corellia together (bonus series and everything), which incidentally also served to level us all the way to the new level cap. Anyway, what can I say about the Sith inquisitor story? Well, I'm afraid I have to admit that this one wasn't one of my favourites. It was by no means bad, but at least for me, it was way too much of a roller-coaster ride. I previously praised the Sith warrior story for managing to "deliver a truly solid experience every step of the way" - and in a way I felt that the Sith inquisitor was the polar opposite of that. Parts of it were absolutely brilliant. I loved the second half of Dromund Kaas and the personal sub-plot that begins in the Dark Temple. The ending of chapter one had me glued to my screen and even replaced the end of the smuggler's chapter one as my favourite (and I did have an absolute blast with the smuggler so that particular bar was set very high). Your first companion's story arc cumulates in what I considered one of the most difficult and meaningful choices I've encountered in the game so far. The problem is that between those flashes of brilliance, there was a whole lot of "meh". 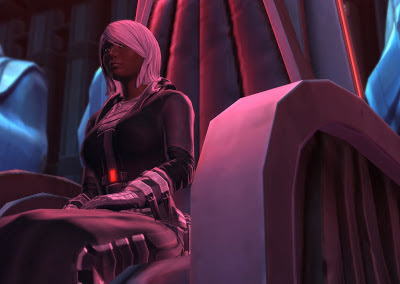 I previously struggled to level an inquisitor on my own because the story just didn't grab me after completing Dromund Kaas: searching for relics for my master seemed kind of dull and lacked the sense of urgency that most other class stories have at this point. I've previously talked about how let down I felt by how acquiring my apprentice played out. And the villain in Acts II and III just fell flat for me. He was a guy who hated me out of principle instead of having any personal reasons, and I never felt massively motivated to fight him. I didn't really want to kill him; I just wanted him to leave me alone! It also didn't help that the way he talked forever reminded me of the manager in Office Space. More than anything though, I could never quite get over the way my character came across as kind of... weak. I'm not someone who needs to see herself as the hero of the day all the time (I was quite happy being a trooper who got bossed around a lot for example, and felt that the Jedi knight story - which many people love for how it lets you perform some amazing feats - was kind of over the top), but... well, let's just say that I actually found myself joking about how my character seemed to be required to pass out at least twice per Act, just so that she could be rescued by her companions or other friendly NPCs. I'm not against using "loss of control" as a plot device to make a point about how you're up against someone who's out of your league, and I felt that both the knight and the warrior story did this well. But on my inquisitor - it just felt like she never really caught up. Everything was a struggle, her plans never quite seemed to work as intended, she constantly needed to enlist help with everything... I even spent a significant chunk of chapter three being dangerously ill! I suppose this is meant to be the story of the underdog who has to claw her way up from nothing - I mean, already the origin story on Korriban shows a marked difference between the inquisitor as a former slave and the warrior as a pampered favourite student. I just felt... that at least to me personally, the pay-off wasn't really there until maybe at the very end, and then it just wasn't enough. I felt like my character should have achieved more in a shorter time, so to speak, instead of spending quite this much time failing over and over again. What say you, fellow Sith inquisitors? I haven't gotten back to my Inquisitor since she picked up her apprentice at the end of Taris --been working on my Commando when I've the time-- but what I saw I really enjoyed. It does have its ups and downs, but I do realize that being an apprentice to a sith lord means a lot of "Here, slave, DO THIS!" What I was intrigued with was the glimpses into the culture in the Sith Empire. The Sith Lords are very much a pampered Upper Class, seeking to preserve their power as much as possible. It's almost as if they realize that the rest of the Empire could bounce them on their collective asses if they don't keep them in line. Well, I didn't mind being ordered around during "the apprentice years". Not knowing why I was doing the things I was doing just left me feeling kind of uninterested (even though I realise that your master not telling you about her plans is a plot point). Once your character gains independence though, it still feels like you're constantly struggling and floundering, unsure what to do. I suspect that was by design. Your character didn't grow up knowing anything other than a slave's life, and now you're thrust into this arcane and byzantine set of politics. Plus knowing all the power you've got means people both hate and fear you. The Sith Warrior is a completely different animal, because you come into this with a much greater understanding of what it means to "be Sith". He also has a potentially better understanding of the honor that some Imps (and a certain ex-Imp) talk about, which the Inquisitor has never really seen. I too have mixed feelings about the Sith Inquisitor's story line. I can certainly relate to almost everything you said, except the part about the "end boss". I despised that person on principle and was extremely annoyed at how many times one actually has to fight exactly the same fight (Come on!). The Inquisitor's archaeological discoveries in Chapter I were rather enjoyable – an apprentice has to do their masters bidding. Playing an Inquisitor teaches the player a lot about micro-managing one's companion. If done properly, even most [HEROIC] missions pose hardly any threat. Therefore, I would highly encourage anyone to play either an Inquisitor or a Sage as one of the first classes. I suppose my passion for "wizard" types and joy for finally having my "magic" making any difference in the story of a game blinded me to the flaws of this storyline. Indeed, compared to the Sith Warrior, you don't really have much motivation to move on in the story. I sure liked starting as an underdog, but the pay-off was not that great. The Warrior's reward is actually far greater. The "villain" for the last two acts was... annoying, but you didn't really feel intimidated by him, or exactly hated him. It is IMPLIED that he hesitates to kill you because he sees a bit of himself in you, but it's never explored enough for it to make a difference. Shame, Bioware. On the other hand, the Warrior's story was a bit too classic "Sith power play" to my taste, and you're constantly serving someone, all the way to the end, even if it's a different master. I like how the Inquisitor has more agency, and is acting on his/her own since act 2, with his/her own power base. I'd say in the end I enjoy the Inquisitor more, due to the greater independency, and because they are in a better position to manipulate people and orchestrate their rise to greater power, or at least greater understanding of the Force, and see things that maybe other characters don't. Again, I guess my tastes go too strongly towards the wizard type.